At a typically enthusiastic event yesterday, T-Mobile’s enigmatic CEO and President John Legere announced that the company would be launching a new initiative that it hopes would remove the awful feeling of buyer’s remorse – a well known problem in the gadget-buying world where we regret picking up that shiny new toy for whatever reason. 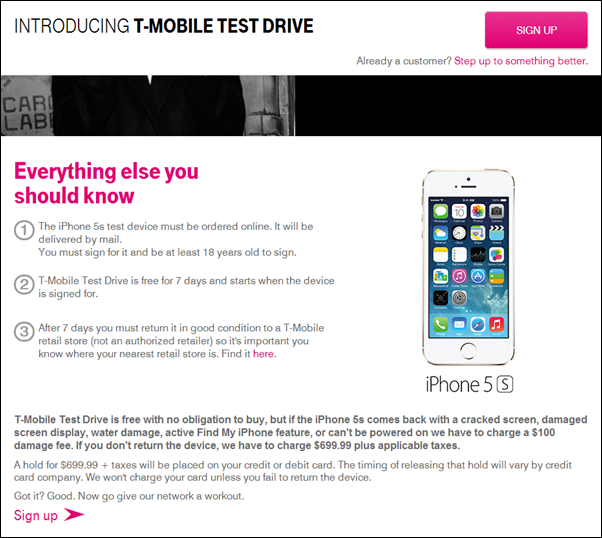 The program, called ‘Test Drive’ sees potential T-Mobile customers being offered a free iPhone 5s – or whatever the current cream of the crop is, so long as it’s got an Apple logo on it – and free, unlimited cellular based services for a full seven days. After that time, they simply drop the phone off at a T-Mobile store and walk away. T-Mobile will obviously be hoping that people would walk away with a new phone and 2-year contract, but there’s no obligation to this offer. John Legere and T-Mobile’s resulting press release says that the idea is a simple one: let customers experience T-Mobile’s network and “put(s) T-Mobile’s data-strong network in the spotlight.” The company now offers LTE in 16 markets across the U.S., with 15 markets supporting the advanced VoLTE technology that everyone is getting so giddy about. Unfortunately, that same press release sees T-Mobile continuing to call itself the ‘Un-carrier,’ so those of us hoping that would die, well, not so much. T-Mobile’s marketing department has gone a little too far over the edge, we fear. The idea of letting potential customers try out a network without locking them into a contract first is something that is so obvious, you wonder why everyone doesn’t do it. It’s a clear sign that T-Mobile is confident in its own network though, and perhaps gives us an indication of the reason the likes of AT&T don’t also offer something similar. T-Mobile is known for off-the-wall advertising campaigns and marketing, and this latest move is one that is sure to grab plenty of attention. Its network will have to offer exceptional results for it to work though, otherwise it’s just giving people a reason to not give it money. 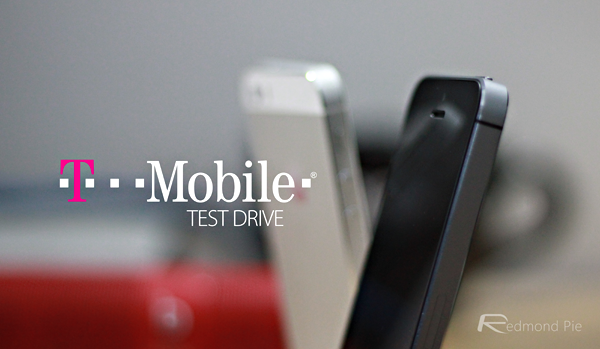 To get started with your free trial, simply head over to: explore.t-mobile.com/test-drive-free-trial where you’ll find all the necessary details regarding rules and obligations. And if you do manage to sign-up, do let us know!